ESWAT: City Under Siege is a Sega Mega Drive action game released for the console in 1990. It is a reimagining of the 1989 arcade game Cyber Police ESWAT. 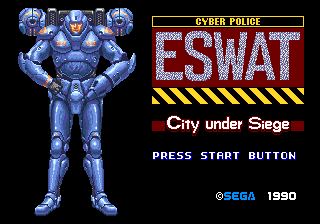 The Sega Master System version of ESWAT: Cyber Police calls itself ESWAT: City Under Siege on its title screen, but is unrelated to this Mega Drive game. A police officer (named Duke Oda in Japanese versions) navigates through the crime-ridden Liberty City, shooting and capturing criminals. He is eventually accepted to the Police Department's top unit, E-SWAT (Enhanced Special Weapons and Tactics) and given a powered exoskeleton to fight against powerful crime bosses who threaten the city. His ultimate goal is to destroy E.Y.E., a super computer. E-SWAT is a run'n gun type of game, on which the player must eliminate threats approaching from either part of the screen; a boss is waiting at the end of each stage. After completing the second mission, you are given a power suit and weapons. Super: Fire three bullets at the same time automatically. M.L. (Missile Launcher): Fire missiles that will skim over surfaces. P.C. (Plasma Cannon): Energy weapon that fires a more powerful projectile if allowed to charge up. Fire: A massive flame thrower kills everybody on the screen but also drains fuel bar. Single use only. The Mega Drive version is different from the arcade and Master System versions, with more platforming sequences added in. There aren't special weapons, though the player can equip more weapons. A jetpack is also available to fly around as long as the suit has power. The japanese version of a game has no continues and title screen has "enhanced specials weapons and tactics" subtitle instead of "City under Siege", while the western version gives player 3 continues that he can use after Game Over screen. When either of the versions is played on PAL system the music will play at correct speed but gameplay was not optimized and thus is slower than intended. Main article: ESWAT: City Under Siege/Comparisons. Main article: ESWAT: City Under Siege/Changelog. Special Thanks to: Mizoran, Ore, Sat Man, Taro Shizuoka, Mt. Maya, Thunder, "Design's Maid", Thomas Yuuda, Yamaichi, "GoodLuck Matsuda"
Main article: ESWAT: City Under Siege/Magazine articles.